100% pure. Product not tested on animals. 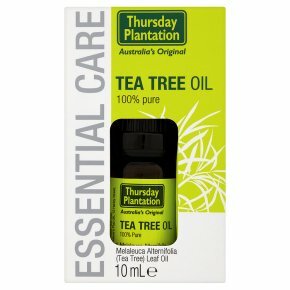 Suitable for vegans.Tea Tree Oil is known for its purifying effect. The oil cleanses deeply, is colourless and does not sting. Directions: Patch test prior to use if concerned about skin sensitivity. Apply directly to skin or with cotton swab. Can be diluted with carrier oil: 5 drops per 10mL. WARNING: Highly concentrated - not to be applied undiluted to sensitive skin. Keep out of reach of children. For external use only. Discontinue use if sensitivity to the preparation occurs.<br><br>CAUTION: Flammable. Harmful if swallowed - may cause lung damage. If swallowed, do not induce vomiting: seek medical attention immediately and show this container or label. Irritating to eyes, respiratory system or skin - in case of contact with eyes, rinse immediately with plenty of water and contact a doctor or Poisons Information Centre.